We were at Skeldon Weir on the Doon today to advise the operators of the hydro scheme where timber baulks may provide the best opportunity to improve migration over this dam. While there’s no doubt the weir is passible, each and ever weir on rivers has an impact. Small or large, the very nature of their construction to create a step in height, can present difficulties to fish in some way or another. Not all fish necessarily, but some weirs are easier passed by larger fish while others, the smaller ones do better. 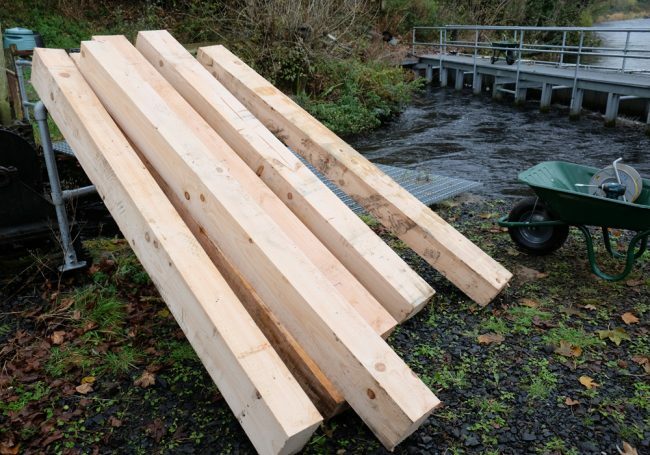 Untreated Larch timbers sourced nearby were used. Untreated timber is difficult to find off the shelf. Without resorting to using oak which can be cost prohibitive, larch is thought to be the best softwood when used untreated as it is more durable than spruce or other pines. The only real difficulty at Skeldon was the depth of flow over the face of the weir towards the lower end of the flow regime. Smaller salmon and trout may therefore have fared better than large fish. As the depth increased with volume, smaller fish may have struggled rather more as the velocity over the face of the weir increased. With concerns raised by anglers that fished the stretch downstream over the rate of abstraction through hydro scheme, the operator requested permission from SEPA to vary their Controlled Activities Regulations licence and allow them to reduce their abstraction at lower flows and increase it at the other end of the scale. This seems a logical and beneficial proposal in such a flow controlled river and there’s little doubt that it would appease anglers and at the same time benefit any fish attempting to migrate during lower waters. Consequently we requested and supported the developer to add two baulks to the weir face that would act as simple fish passes. A timber baulk angled on the face of the weir is designed to concentrate and slow flow while providing increased depth over the surface of the structure. We thought 2 baulks may be appropriate at this weir due to its length. Today, we experimented with a couple of options before agreeing a final position. Two sloping timber baulks have been added to the face of the weir near where we’ve watched salmon swim over with their backs and tails largely out of the water. 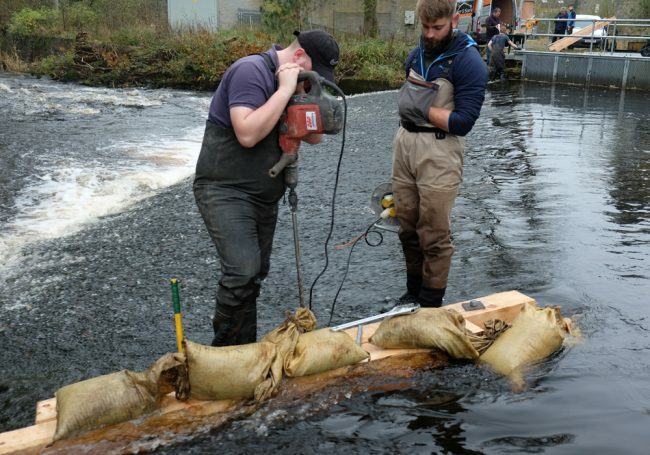 In future, fish will be able to head upstream and over the weir benefitting from increased depth making it easier, particularly for larger fish or in lower flows. The baulks we helped install today concentrating flows, slowing it. We observed the depth increase from around 3″ to 9″ over the face of the weir after the baulks were installed. This was exactly the sort of result we anticipated. There are other routes for migration over the weir and those remain unaffected but it will be interesting to see if we can see if we see fish using these new routes in low water. We immediately received questions from a local resident concerned about increased flood risk to their property which we quickly alleviated; it won’t. 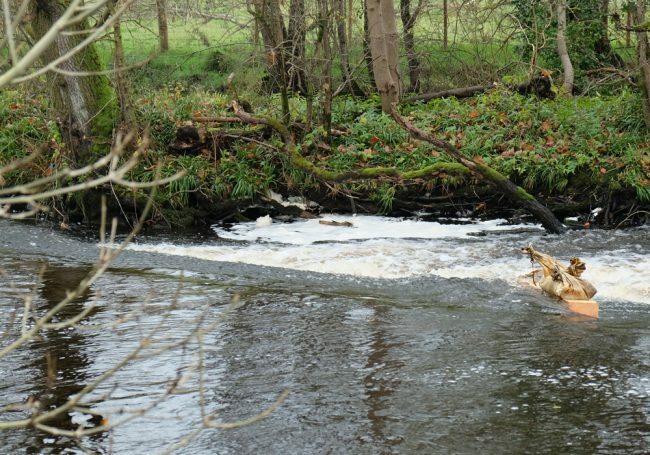 Returning to the office this afternoon and we received an email wanting the Trust to pay to remove these baulks as they would impeded fish passage, hamper canoeing, prevent otters and wildlife using the weir and spoil the scenic beauty of the dam…. The left hand baulk almost completed. The increased depth of water flowing over the face can be seen on the left of the timber. No matter what we do, there will always be those against. We don’t consider the concerns raised are all valid and I’ve explained our thinking behind the baulks to the author. Our main focus has to be improving habitat and opportunities for fish migration particularly at a time when stocks are so challenged by poor marine survival. With the Doon proposed as a Category 2 river in 2019, conservation measures are required that benefit fish stocks. We consider this to be appropriate and beneficial.